Mobility maneuvers help keep your joints supple so that you walk better, have better posture, and reduce risk of injury. Improving flexibility is an important part of your successful-aging strategy. How do your joints and spine feel upon rising in the morning –– any stiffness? Mobility can be made better. 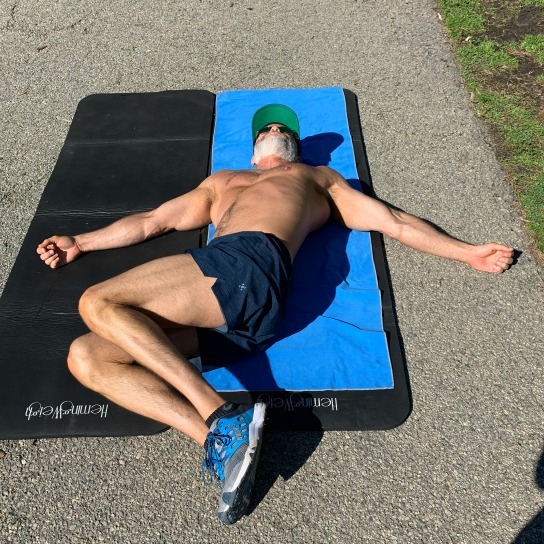 If you’re in your 50s or above, at least one of your workouts each week needs to be mobility-related – such as yoga, pilates, swimming, full-body stretching, or mobility drills. Each of us tends to stand in front of one particular mirror in our home and then to think what we see in that mirror is how we appear to others. People take an unconscious assessment of your health and bearing when they see you move. It’s how you move that matters. 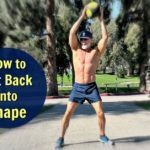 Here are eleven exercises to get you started on a more supple, better-looking body that moves well. There are 3 circuits in this workout, and each circuit is done three times. Of the relatively few people who exercise consistently, most repeat the same type of workout every week. This can be unwise because a variety of movements help reduce risk of overuse injuries to the joints – and muscles and help prevent you from becoming asymmetrically developed. 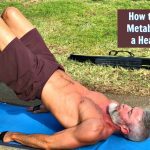 What follows is a mobility workout that emphasizes drills, movements, calisthenics, and maneuvers to improve your flexibility, alignment, stability, and functioning. Stability is an important benefit of this workout, too. The typical problem areas for most people – shoulders, lower back, hips, knees, and ankles – sometimes need to be able to stabilize, not just mobilize. This workout is appropriate for beginners as well as athletes over the age of 50. It’s effective for both men and women. 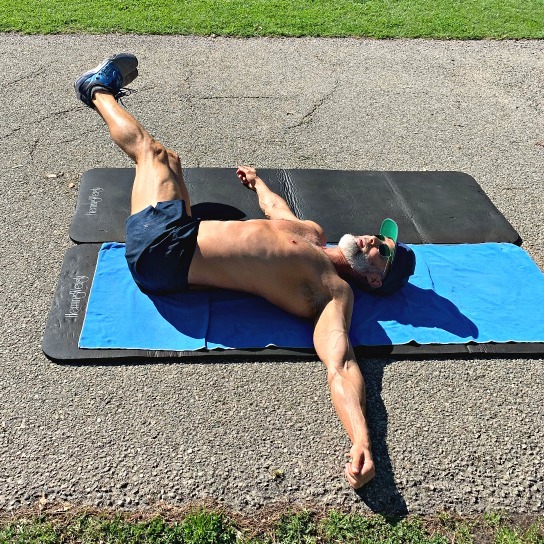 Dane Findley, age 53, incorporates mobility maneuvers into each workout. With each passing year, mobility comprises a larger portion of his typical workout. do 20 repetitions (10 each side). 20 reps (10 each side). stand upright again to perfect posture. Lie on your side, with hands in a prayer position and arms straight. 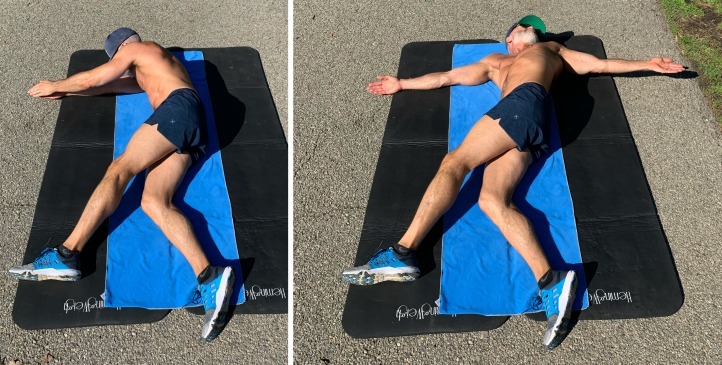 Keeping your legs and hips still, simply rotate your spine so that your top arm circles up and over, resting your hand on the other side of your torso. Your head rotates, too, following your gaze. 20 reps (10 each side). Take a weighted ball and reach it up and over your head, slamming it down (and catching it as it bounces back up) on alternating sides of your body. 20 reps, 10 each side. Though mobility maneuvers are helpful for keeping joints supple – and even improving flexibility and alignment – perhaps the most impactful way to keep joints healthy is to lessen inflammation inside the body. How can you best lessen inflammation? By reducing your intake of inflammatory foods. This solves stiff-joints closer to the source of the problem. Irritating foods, when consistently ingested, have a tendency to exhaust the body’s immune system. Mobility maneuvers help keep joints supple so you move better, have better posture, and reduce injury risk. This 11-exercise workout will help. Video included. The typical problem areas for most people – shoulders, lower back, hips, knees, and ankles – need extra attention, especially as we get older. Proceed slowly. Breathe evenly. Be mindful. 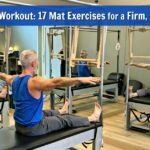 The idea behind this particular workout is to help your joints become even more supple than they are now. Obtain clearance from your doctor beforehand. A tired immune system is a confused immune system – and that means the body can mistakenly attack its own healthy tissues, often focusing on the joints (including the rib cage), muscles, and rib cage. Ask your doctor about the possibility of experimenting with an anti-inflammatory diet. Though each person responds differently to different foods, most anti-inflammatory diets remove (or reduce) grains, sugar, dairy, synthetics, and trans fats. I encourage you to always consult with your doctor before making any significant lifestyle changes, including adopting new workout routines.